The "go to" place to find out what is happening in our classroom! CONGRATULATIONS to our wonderful room mom, Becky White! 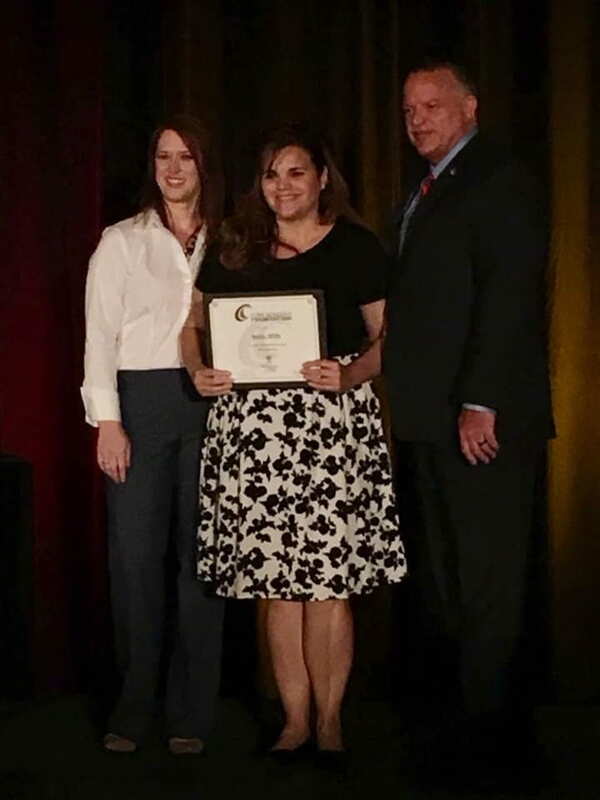 She was named Ford’s 2019 Volunteer of the Year today at a special luncheon hosted by CCSD!! We are so proud for you and appreciative for all you do in our class and at Ford ES. Way to go!! Congratulations to our star student of the past, Ava Eison and our current Star Student, Shrish Adhikari! Happy Birthday wishes go to Amelia Bevels and Sophia Capalbo! April 25: Life Cycle Projects due! April 30: Evening in the Garden: time: 6-8 pm (7pm: 2nd graders perform) Wear red class t-shirts! May 3: Pastries for Parents: in our classroom from 7:15-7:45…All are welcome! May 10: K-2 Field Day! What have we been learning? What will we learn? READING: Last week and this week we have been learning how to identify different types of context clues within texts to understand the meaning of words. Some include: definitions, examples, antonyms, and synonyms. We will continue to use context clues as we learn to infer to aid in comprehension. Next week we will learn about main ideas in paragraphs and stories and the details that support them. PHONICS/SPELLING: Our spelling pattern for the last few weeks included words with -y and -ly endings. Next week we will revisit prefixes as we explore words with the -un prefix. We have learned about prefixes earlier in the year, so this will be a review. Thank you for encouraging the correct use of our spelling patterns and high frequency words throughout everyday writing as well as starting all sentences and proper nouns with capital letters! WRITING: Students integrated Social Studies with a review of informational writing as they researched and wrote about the life and contributions of our 39th U.S. President Jimmy Carter. Stories have been assessed and are coming home next week. Enjoy reading what our awesome authors wrote! MATH: After the break, students used place value skip counting strategies to multiply numbers! We read repeated addition arrays to determine facts. This week and last week our focus was on reviewing our second grade 3 digit addition and subtraction strategies. Students also studied completed strategies and performed error analysis to explain how the strategies worked or not. Next week we dive into GEOMETRY as we discover 2 dimensional and 3 dimensional shapes! SCIENCE: We have been enjoying our study of life cycles: plants, birds, mammals, amphibians, and insects. Students learned about the parts of plants and purposes of the parts last week. We explored a plant’s life cycle. We observed the life cycle in experiments with our potato plants and lima beans. This week our class was so excited to receive fertilized chicken eggs! 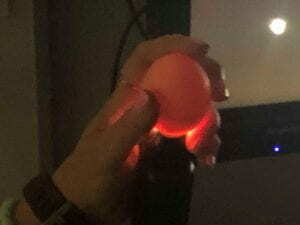 We are incubating the eggs and are enjoying learning about a chicken’s life cycle. 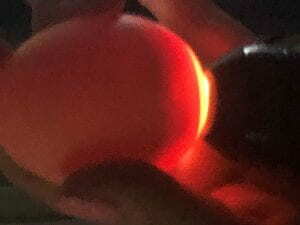 In about 11 days we will watch the hatching of our baby chicks!! We have also compared and contrasted a bird’s life cycle to a mammal’s (specifically our dwarf hamster). We have explored insects and the life cycle of a butterfly as we focused on our yearlong PBL of the Monarch butterflies! Students went on a webquest to research the Monarch population decrease, life cycle stages, and things Monarchs need in their habitats. Students are currently using the engineer design process to create a Monarch habitat right here at Ford! Groups worked together to design…we choose one great design next week to create together! We can’t wait! Candling our chicken eggs together! Welcome Spring!! Two weeks ago we started our 4th nine weeks together with this awesome class! Thank you for signing your child’s report card envelope so promptly! Please keep up the fantastic nonfiction reading at home nightly to build comprehension and vocabulary skills. Addition and subtraction facts to 20 will be assessed for fluency at the end of this quarter. Thanks so much for encouraging this practice as well. Congratulations to our star students of the past: Kaleb Akridge and Luke McCreary! We loved learning more about you! Happy Birthday wishes go to Nicole Caslavka and Dylan Larsen! April 13: Community Service Day at Ford…Come help clean out gardens and spruce up our school grounds! April 30: Evening in the Garden: Info can be found HERE! READING: Non-fiction, Non-fiction, Non-fiction!!!! We are knee deep in applying non-fiction comprehension skills and fluency. Social Studies and Reading have been integrated as we have been reading the biography of and researching Jimmy Carter. Students are encouraged to read non-fiction books and materials on their level to further comprehension and vocabulary skills. Upcoming topics of interest may include plant, animal, insect, and amphibian life cycles! Students are being taught and assessed in small groups according to level: finding text evidence to support non-fiction comprehension and new vocabulary. This will be ongoing through the end of the quarter. This week and next week we are strengthening vocabulary by using different types of context clues to determine unknown words while reading. PHONICS/SPELLING: Our spelling patterns last week were comparatives and superlatives spelled with -er and -est. Next week we explore words with -y endings. Students will have lists to study over the spring break. Thank you for encouraging the correct use of our spelling patterns and high frequency words throughout everyday writing as well as starting all sentences and proper nouns with capital letters! GRAMMAR: Last week we revisited what verbs are and learned how to use past tense verbs in our speaking, reading, and writing. Our focus was on past tense verbs, especially irregular past tense verbs that do not simply end in -ed. WRITING: Quarter 4 provides a review for all of our writing genres! This week we reviewed the great parts of an informational story and students were given organizers to write informational stories about Jimmy Carter. MATH: Last week we kicked off a review of place value to 1,000! We focused on writing numbers three ways and skip counting. This week students learned the foundation of multiplication as they learned to read and draw arrays. Next week we will review strategies for addition to 1,000 and understand how to explain how we use them. SOCIAL STUDIES: We are enjoying learning about Jimmy Carter, his origins in Georgia, and his contributions to civil and human rights. 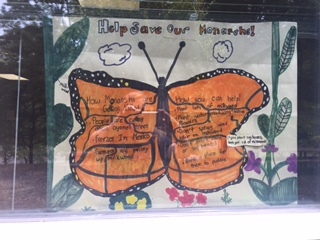 After seeing a great performance of Rosie and the Butterfly, students learned how Mrs. Rosalynn Carter has contributed to the national Monarch movement to save these pollinators! Yearlong STEM/PBL: Join us as we continue tracking the monarch butterflies on their journey north! Students are observing via the Journey North website. Next month we will have a culminating STEM/Problem Based Lesson answering the questions, “Why are the Monarchs decreasing in number, and what can we do about it?” Students will research, design and create Monarch habitats! What a fantastic few weeks we have had! Congratulations to our past and present star students: Lucy Johnson, Sophia Capalbo, and next week’s Kaleb Akridge! We love learning more about you! Happy birthday wishes go to Luke McCreary, Ryder Cook, and Nicole Caslavka! MANY MANY thanks go to Mrs. White and all she did to shower the teachers with love during Teacher Appreciation Week. I appreciate the sweet cards, flowers, and school supplies from families. Your child is such a gift to me! March 22: Q3 Report cards go home: Please keep the report and sign and return the white envelope. April 13: Community Work Day (8-12): Come help clean out our Ford gardens! What have we learned? What will we learn? READING: Last week and this week we read different versions of well known fairy tales: traditional ones and ones with a twist! Students compared and contrasted the characters, setting, and plot in each tale. Next week we will integrate Social Studies with reading strategies as we look for key ideas in nonfiction texts about Jimmy Carter. WRITING: Students shared their last opinion story for the quarter persuading a leprechaun to give up his gold! They had awesome reasons with examples/explanations. Students have learned to state an opinion in a good opening and closing as well as give solid reasons supporting their opinion along with examples or explanations. Next quarter we’ll review all three types of writing: Narrative, Informational, and Opinion. PHONICS/SPELLING: Last week we reviewed irregular plural nouns. This was a topic learned about earlier in the year. This week students learned about suffix endings: -ed and -ing and how these add to or change root words. Next week, students will learn about -er and -or endings. Students should be applying all of these and previously learned patterns independently as well as grade level high frequency words. MATH: Students enjoyed extending money counting to include quarters, half dollars and dollars last week. This week we used what we know about counting money to solve one and two step word problems involving money. Students use money counting skills EVERY week when they get paid for doing class jobs and count/save for Campisi Coupons! STEM: Our class was able to utilize our new iPads last week as we wrapped up our STEM sundial testing. We had a blast using a stop motion app to record the shadows at different times of the day and then see how the shadow moved with the time lapse of the stop motion movie. Check this out in your child’ s Seesaw portfolio! Last week we had an amazing STEM focus day! Students were able to Skype with astronaut, Don Thomas. Mr. Thomas shared his personal photos and experiences of his Columbia space shuttle missions! He even told us about NASA’s plans of the near future. To learn more about Mr. Thomas, visit his website at http://ohioastronaut.com/. 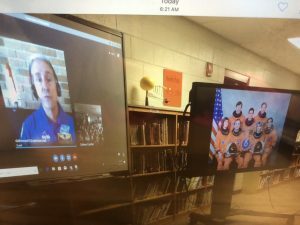 This was a fascinating way to encourage our future astronauts and connect what we have learned about the Earth, sun, and stars! WELCOME MARCH! Happy birthday wishes go to Ava Eisonl! We loved learning about Sam Drake before the break and look forward to learning more about Lucy Johnson, our Star Student for next week! Next week students will see an excellent performing arts show about Rosalyn Carter and her Monarch butterfly trails. This is a great reintroduction to these great creatures and our year long problem based learning study of the monarch population. We will also talk about how our Monarch pollinator gardens here at Ford are official/certified weigh stations on the Rosalyn Carter Butterfly Trail that extends through the nation! In the coming weeks we will observe where the Monarchs are now in their journey north from Mexico. Follow the link in the bookmarks section of this blog to observe at home with us! READING: Last week we continued our study of different characters’ points of view. This week we dove into FAIRY TALES! We are reading different versions of fairy tales: traditional and ones with new twists. The students are enjoying comparing and contrasting the characters, settings, and plots in each. Next week we will continue this study and students will be assessed at the end of the week. PHONICS/SPELLING: We have reviewed the spelling patterns found in contractions and plural nouns. Next week we will revisit irregular plural nouns and how to spell and use them. Students are expected to apply these and previously taught patterns in everyday writing as well as grade level sight words. GRAMMAR: Students learned what adverbs were last week and how we use them in complete sentences to modify verbs, adjectives, and other adverbs. This week we learned about adjectives and closely related adjectives and the nouns they modify. Next week we will learn how to choose between adjectives and adverbs in reading and writing. MATH: Last week we jumped right into a review of 2 step word problems within 100 using the addition and subtraction strategies. This is a review from quarters 1 and 2. This week students integrated our STEM study of measuring time with math as we learned to tell time on an analog and digital clock to the hour, half hour, quarter hour, and to the 5 minute intervals. Next week we will continue counting money as students review pennies, nickels, and dimes. We will extend to quarters, half dollars, and dollars. SCIENCE/S.T.E.M. : This month we are connecting the Earth, sun, and stars! Students loved participating in our 4th STEM lesson this week integrating what we know about the sun and shadows. They followed the engineer design process as we asked the essential question, “How can we measure time using the sun?”. Students brainstormed ideas to create devices that would measure the sun. In cooperative pairs, students collaborated to come up with a final plan to build a sundial. Friday, students created their sundials. These plans and projects are published in your child’s Seesaw account. Check them out! Next week, we will revisit our study of stars and compare them to our closest star, the sun. We’ll even SKYPE WITH A REAL ASTRONAUT! It has been a fantastic week in second grade! Congratulations to our past and present Star Students: Reese Christopher and Dylan Larsen. We enjoyed learning more about these great students! Happy birthday wishes go to Anderson White! Thanks so much to our fabulous Earth parents who taught us about the changing seasons last week! Students observed different plants and recorded their winter observations. READING: Last week and this week we focused on the point of view of various characters in a story. We compared and contrasted the wolf and the pigs in the True Story of the 3 Little Pigs. Students focused on each character’s point of view and then used the evidence from the story to write an opinion paper about the point of view they most believed. We continue to discover points of view in guided reading groups as well. Points of view in fiction and nonfiction stories will be our focus for next week! PHONICS/SPELLING: We have learned the spelling patterns of -le, -al, and -el at the end of words. This week we explored compound words. Next week’s unit offers a review of contractions. Students are expected to apply these and previously taught patterns in everyday writing as well as grade level sight words. GRAMMAR: Last week students learned what verbs and closely related verbs are. Students will learn what adverbs are next week and how we use them in complete sentences to modify verbs, adjectives, and other adverbs. Next week we will learn about adjectives and how we choose between adjectives and adverbs when reading and writing. WRITING: Last week students learned how to focus on expressing reasons and examples in opinion writing. We have also focused on writing strong beginnings and endings for our readers when opinion writing as they responded to the book Cat Vs. Dog…Would you rather live with cat or dog from the story? This week students used what they knew about opinion story organization to organize and write an opinion story as a literature response to the fairy tales of The 3 Little Pigs and The True Story of the 3 Little Pigs (the wolf’s point of view). MATH: Last week we learned how to use place value strategies to subtract 2 numbers within 1000. This week we practiced mixed equations: addition and subtraction. Students were assessed on their use of place value strategies. Next week we are jumping right in to a review of 2 step word problems within 100 using the same strategies. This is a review from quarters 1 and 2. SOCIAL STUDIES: Last week we wrapped up our study of Juliet Gordon Lowe, the founder of the Girl Scouts. Our next famous Georgian to learn about in quarter 4 will be Jimmy Carter! STEM/SCIENCE: This week we studied the attributes of our closest star, the sun. Students had a great time creating an interactive sun in the hall with all its parts and facts. Next week students will explore the relationship the sun has with the Earth and its changing seasons. Students will learn how the length of days relate to our seasonal changes. Thanks so much for your support of this fun unit at home by encouraging your child to record their moon observations nightly! I have heard lots of excitement here in the classroom about the observations at home! At the end of February, we will review our phases of the moon on our calendars and discover the patterns the moon makes! * Please turn in your class t-shirt order with $5 asap! * A Fall Picture Form is in your child’s red folder today. Please fill this out if you want to order a package and send back with your child on picture day, Wednesday, August 15th. ALL children will get a picture made for the yearbook! What are we learning? What will we learn? LANGUAGE ARTS/READING: This week we read books with cooperation and building a classroom family as the central themes. Students were also individually assessed on comprehension and vocabulary levels. Next week we will introduce Daily 5 CAFE Comprehension strategies: what it means to read “Good Fit” books, check for understanding, 3 ways to read a book, using visualization to comprehend, and reviewing key details in a story (who, what, when, where, why, how). PHONICS/SPELLING: Next week’s patterns will include a review of initial and final consonant blends (2 and 3 letter) and digraphs: ch, th, sh, and wh. There will not be a spelling test next week. Our first differentiated spelling test will be on August 23rd. * Spelling words will be in your child’s agenda for Unit 1 on Friday, August 16th. Please encourage your child to find time during the week to practice their words and the spelling patterns. Tests will be given on Thursdays along with dictation. Check out our Spelling City website for fun ways to practice spelling words at https://www.spellingcity.com/campisiford/. WRITING: We have learned what great writers do and purposes for writing. Students were asked to write a narrative with an organizer and one without an organizer as a pre-assessment to this quarter’s narrative writing. Next week we will brainstorm small moments and start to organize ideas for writing. SOCIAL STUDIES: Next week we will kick off the study of our state, Georgia. We will learn about it’s geography and the five regions of Georgia: Appalachian Plateau, Ridge and Valley, Blue Ridge, Piedmont, and Coastal Plain. We will discuss our connections to well known places and resources within each region! MATH: Students were given pretests this week to determine math readiness for Quarter 1. Next week we will be reviewing basic addition facts and strategies: Math vocabulary, counting on, counting up, doubles and doubles plus one, and making ten. We have been reviewing mental math strategies (decomposing numbers 1-9). Please make sure your child practices addition and subtraction facts to 20!!! Our standard is to apply them mentally and fluently! SCIENCE: Students set up their S.T.E.M. daily journals. We discussed what S.T.E.M. is and enjoyed a cooperative S.T.E.M. project this week to work on problem solving skills with partners. Check out how we worked together to “Save Fred” in your child’s Seesaw portfolio! HEALTH: We explored healthy vs. unhealthy food choices last week. Please be aware that we have a “Peanut Safe” room! Please refrain from sending in snacks with peanuts in them. August 3, 2018: A GREAT FIRST WEEK!! What a wonderful first week we had in second grade! Our class is a VERY SWEET and hard working one. I am so proud of all my students for making it through a great week of routines, meeting new friends and teachers, and getting acclimated to new expectations (and familiar ones):). Please give your child a hug for being great listeners and friends to others this week! Parents, please join me on Thursday, August 9th from 6-8 for Ford’s Open House. We will discuss 2nd grade procedures and expectations and take a look at our curriculum together. I look forward to seeing you again! Feel free to come to one of the 2 sessions available: 6-7, 7-7:45. There will be a PTSA meeting afterwards. Thanks so much for your support! Please refer to this blog biweekly for class newsletters. I will publish reminders that pertain to our class as well as the skills and standards being covered in class. Check out the links and pages on this site to access information like class lists, spelling words, and web links/apps to explore. It is a one stop shop! Help us to save the Monarchs! BOOK CREATOR *only works in Google Chrome! Coding Fun! A free website that teaches students how to code! Journey North: Monarchs Find out great information about Monarch butterflies and their journeys across North America! Lexile Book Levels Check any book to find out the Lexile level! Math Word Problem app Using unit bars to solve word problems! Monarch Map of Migration Where are all the Monarchs right now? Track migration routes daily and upload sightings!!! Ooka Island Phonics 1. Choose “Log in with Active Directory”. 2. Choose red Scholastic box. 3. Choose Ooka Island launch. Spelling City Spelling word practice! !